Every long-range precision shooter can benefit from an accurate, full-featured portable wind and weather monitor. Right now the relatively new Kestrel 4500 is the best hand-held weather station on the market. Introduced at the 2007 SHOT Show, The Kestrel 4500 Pocket Weather Tracker is a complete weather instrument, offering instant and accurate measurement of wind speed, wind direction (including crosswind and headwind/tailwind), temperature, humidity, density altitude, barometric pressure and numerous other derived functions. The Kestrel 4500 has a built-in digital compass, a feature not found on other Kestrels. This allows you to track and log wind direction as well as wind speed. Wind direction is displayed in degrees and cardinal compass points. Weekend shooters and military snipers alike have been calling for a Kestrel Meter with crosswind calculation for years — and the Kestrel 4500 now offers that capability. By means of its built-in digital compass, the Kestrel 4500 provides Wind Direction and velocity, Crosswind direction and velocity, and Headwind/Trailwind direction and velocity. 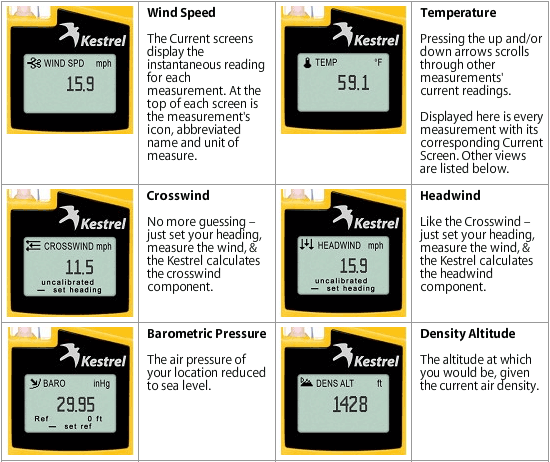 In addition to these wind functions, the Kestrel 4500 will also display: Max Wind Gust, Average Wind Speed, Temperature, Wind Chill, Relative Humidity, Heat Stress Index, Dewpoint Temp, Wet Bulb Temp, Barometric Pressure, Altitude, and Density Altitude. These features are illustrated in a handy flash-based “Virtual Tour” that shows all the Kestrel 4500’s product features. CLICK HERE for Kestrel 4500 Virtual Tour with Feature Demos. The bright yellow Kestrel 4500 is available for $289.00 from Kestrelmeters.com. An olive drab version with Night Vision-friendly backlighting is offered for $309.00 from the same vendor. CLICK HERE to download SniperWorkx.com KESTREL 4500 Review in .pdf format. Nielsen-Kellerman, maker of Kestrel Weather trackers, is sponsoring the U.S. Long Range Rifle Teams in the Spirit of America Match (SOA) running this week at the NRA Whittington Center in Raton, NM. The SOA features one of shooting’s most prestigious international matches, the America Trophy Match. This September, the Match will be held for the first time since 2005. The national teams from Great Britain and Australia will compete against the U.S. National Team shooting at distances from 300 to 1,000 yards. The U.S. Long Range Rifle Teams consist of the National Team (who include former members of the Palma® team), the Veterans’ team, and the USA Young Eagles Under 21 / Under 25 team. Share the post "Kestrel 4500 Offers Full Set of Functions Including Crosswind Values and Density Altitude"
For more info, or to reserve space, call (972) 875-5318 or email jennifer.hull [at] shilen.com. 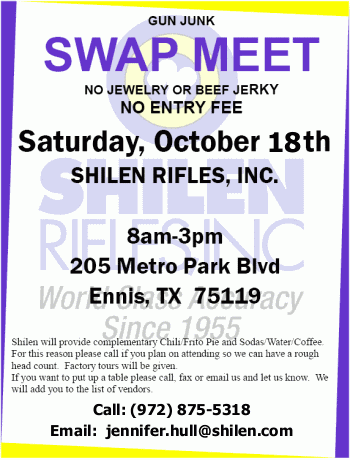 Share the post "Shilen Swap Meet on October 18th in Ennis, TX"